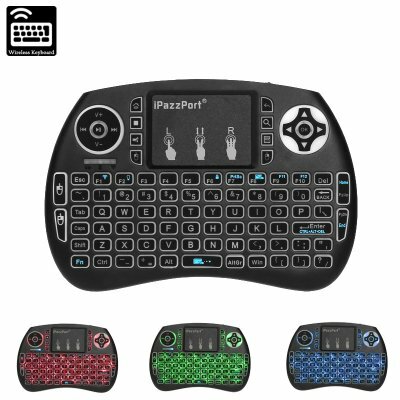 Successfully Added Wireless Keyboard iPazzPort - QWERTY, Backlit, 2.4GHz Wireless, 10m Range, 92 Keys, 800mAh, For Windows, MAC, Linux, Android to your Shopping Cart. Your wireless mini keyboard comes with an intergraded mouse pad. Thanks to this, you’ll no longer need an external mouse to browse through all your devices’ features. The sensitive mouse pad can additionally be used for handwriting purposes. This compact design lets you navigate and control all your electronics in a simple and convenient manner. Your wireless keypad features rechargeable built-in 800mAh battery. This cell lets you use your gizmo for weeks in a row. Additionally, it comes with auto sleep and wake-up functions to further increase the usage time of your device.